The temptation to manage your own investment property is understandable. You probably think you can save money by not paying a management fee every month. Maybe you like to do home improvement projects, and you think you’ll have no problem keeping up with the maintenance and repairs that your property needs. DIY property management can work for some Fort Worth rental property owners. If you have a lot of time to dedicate to finding tenants, screening applications, managing resident requests, and keeping your home maintained, you might be able to do it successfully. If you’re able to stay up to date on all the laws pertaining to landlord and tenant relationships and behavior, you probably won’t have to worry about lawsuits or complaints. And, if you follow the rental market closely and you understand the local rental rates and tenant pool, you won’t have to worry about losing money on low rents and high vacancy rates as a DIY landlord. Vacancy days can kill your cash flow. As a landlord, it can be tempting to cut corners to reduce your costs during a vacancy, but that often leads to your home being on the market longer. Below we share information on how Fort Worth rental management companies can help you reduce vacancy days. Vacancy days are the number of days in between a tenant moving out and a new one moving in. During this time you are not earning rental income but your costs have not decreased. In fact, costs tend to increase during vacancy days as you pay for things like re-keying, touching up for a new tenant, and marketing your home. Many landlords also take the time between tenants to address larger, planned construction projects like switching out carpets for vinyl flooring. Even with sufficient planning, a long vacancy will affect your cash flow negatively and jeopardize your investment. Fort Worth rental management companies can help you avoid extended vacancies, but first, you have to understand what leads to these vacancy days. What Leads to Long Vacancy Periods? Vacancy days are a fact of life even for the best property management companies in Fort Worth. But understanding factors that lead to long vacancy days can help you minimize their impact. Showing Too Early. Your potential tenant will want to imagine their life in the home, which can be hard if there is another tenant still occupying the home. The sights, sounds, and smells of someone else living in the home can turn off a potential tenant making their first impression a bad one. Likewise, construction projects, however minor, should be complete before you show the home. Keeping Utilities Off. Turning the utilities off between tenants may seem like an easy way to cut costs, but they can lead to a longer vacancy. Just like showing your home too early, showing it when the utilities are off will cause potential tenants to have a hard time imagining themselves in the home. Incorrect Pricing. When your rental is priced incorrectly it can lead to more days on the market. Rentals priced too high will have a hard time finding a tenant in a market flooded with similar homes at a lower rate. Rentals priced too low signal to tenants that there is something wrong with the property and they may avoid even taking the time to view it. Little or No Marketing. Marketing, especially in the digital age, is an important part of property management. Most tenants start their search online and only view properties they have already seen photos of on their favorite website. A sign in the front yard will not be enough to bring in quality tenants. To lease your property faster, you need to address the factors that lead to leasing delays. Getting Your Property “Rent-Ready”: re-key, touch up paint, and fix broken fixtures. When done efficiently this process can take as little as a few days. Fort Worth rental management companies can help you with this process. Zillow has a handy checklist of 12 steps to get your home rent ready. Curb-Appeal: even if your property is looking great and working well on the inside, some tenants will be turned off by the curb-appeal and opt for a “prettier” home. Take a look at your home from the street level and try to find ways to spruce it up. HGTV has a list of 8 Budget Curb Appeal Projects you can do to boost their home’s appeal. Use the Internet: post your home on as many rental websites as possible for maximum exposure. Use photos that show off the best side of your home. A video walkthrough is also recommended so potential tenants can get a better idea of how the property is laid out. To see examples of a video walkthrough see our YouTube page. HGTV also has an article about how to take great photos of your home. Property management is often a delicate balance between spending money and saving money. When dealing with a vacancy, some landlords will try to minimize costs by focusing on the wrong areas. Doing this will often end up with a longer vacancy and more money lost. Think of it this way: your property typically rents out for $1,440 per month (the average according to Zillow). If you spend $500 to spruce up your property, market it, and keep the utilities on for one month, you will be more likely to rent the property within that month. Your total turnover loss will be one month of rent plus $500, a total of $1,940. If you decide to do the bare minimum (rekeying, minimal cleaning), turn the utilities off, and only put a sign in the front yard, you could spend closer to $50. But after three months of vacancy, your turnover loss will be $4,370. 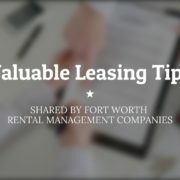 Experienced Fort Worth rental management companies can confirm that not skipping important steps, even if there is an upfront cost, will turn around and make you more money in the long run. An experienced property management company can help you determine what factors could lead to a long vacancy at your home. Property managers who work with tenants regularly are more in tune with what these tenants are looking for in a rental home. Our property managers know what amenities tenants want, how to price your rental appropriately, and what websites to market on. At Specialized Property Management Fort Worth we have a proven track record of short vacancy days. In fact, most of our properties are leased in under 29 days. Short vacancies mean money in your pocket. An experienced property manager will inspect your home and make recommendations that will shorten vacancy days and cut costs where it makes sense. As one of the best property management companies in Fort Worth, we use our knowledge and expertise for your benefit. Give us a call today to hear about all our services and schedule a free rental consultation.